We’d love your help. Let us know what’s wrong with this preview of When I Fall In Love by Miranda Dickinson. ...but eighteen months on from the biggest challenge of her life, she is doing just that –because she made a promise to the person who believed in her the most. To ask other readers questions about When I Fall In Love, please sign up. I am a huge fan of Miranda Dickinson I have fallen in love with all of her books so far and the way they are like real-life fairy tales. For me, It Started With A Kiss was my favourite book that I read last year, which by the way, if you have not read then buy it, borrow it, read it, it is lovely! Anyways, I was very very excited about Miranda’s new release, and I couldn’t wait to get started! Without giving too much away, Elsie Maynard has had a difficult time in life, and eighteen months on, wa I am a huge fan of Miranda Dickinson I have fallen in love with all of her books so far and the way they are like real-life fairy tales. For me, It Started With A Kiss was my favourite book that I read last year, which by the way, if you have not read then buy it, borrow it, read it, it is lovely! Anyways, I was very very excited about Miranda’s new release, and I couldn’t wait to get started! Without giving too much away, Elsie Maynard has had a difficult time in life, and eighteen months on, wants to do something in her life. After an impromptu piano and singing performance at a seaside cafe in Brighton after being dared to by her sister Daisy, Woody Jenson, ex-band member of the 80′s rocker group Hellfinger, jumps into Elsie’s life with a proposition for her: Starting a choir with him. And not just any old choir, but a choir with a difference, with a sparkle and a bang to them. Soon Elsie and Woody set up rehearsals in the ice cream cafe where Elsie works, and The Sundaes is born – A mix of local people who all want to belong to something and have a sense of community around them. From young couple Danny and Aoife, to louder than life Sasha, to the elderly and sweet Irene – the Sundaes has it all! Alongside Elsie’s new project, Elsie wants to start dating again…Will she find her happiness and figure out where she belongs? I absolutely LOVED this book. As I’ve said from the beginning, It Started With A Kiss was a stand-out book for me, and Miranda has done it again, bringing out a truly beautiful book that will touch your heart, take you on a rollercoaster of a journey and at the end having you believing all over again in the romance of fairy-tales and happiness. Elsie is the perfect lead. I warmed to her straight away, as I’m sure everyone who reds this book will too! I really rooted for Elsie with the choir, and I desperately wanted her to have the life she so deserves. I became very emotionally involved with Elsie, I cringed at her embarrassing situations, I laughed with her during her conversations with the crazy Woody Jenson, and I cried with her during the sad moments. After my journey with her, I feel as though I know her as well as my best friend, and I would be absolutely honoured to know her in real life! The characters were EXCEPTIONAL! I cannot fault Miranda on one single aspects of her characters, they were perfect and every single one of them added to the story. I particularly loved how each character in the book not only had their own part to play in the main event, but they each had their own individual story that was delicately explored and intricately woven into the novel. It was such a joy getting to know each character, forming a bond with them and learning more about their personalities. Personal favourite characters of mine include the eccentric but charming Woody – I think his humour and optimism really brightened up the story, he had me giggling all the time with the way he is! I loved Daisy and her loyalty to her younger sister. Irene was also a wonderful lady who in many ways reminded me of my Nan, so I thoroughly enjoyed the parts that she was in. The Sundaes as a whole were brilliant, I’ve never looked forward to reading about what a choir gets up to more in my life! With some air guitar moves and crazy mash-ups, they had me laughing along with them all the way! The List – Now I can’t give this part away but when you read the book you will get it. This idea was brilliant. Miranda really brought the story into my heart with this, and it added a beautiful layer to the book. It was touching, it was imaginative and it had me laughing one minute at the scenes that featured because of The List, and crying the next because of the sentiment. I will admit here, I cried buckets! If like me, you got a little sensitive, you’re a bit soppy or a hopeless romantic, you will need a box of tissues! I imagine this book will get comparisons to a certain book by Cecelia Ahern, and you’ll find out why when you read it, but coming from a huge fan of Cecelia, I think Miranda may have just topped it and completely deserves all the success she gets from this book. First and foremost When I Fall in Love, though you’d definitely think as much from the very festive and lovely cover art, is not a Christmas themed book. In fact, not a single part of it is set in December. What it is is a gorgeous story about moving on from a great loss and discovering life and how to love once again, and it definitely has that magical feeling. When I Fall in Love is the kind of book that can be read and enjoyed at any time of year and as such would make a perfect Christmas pre First and foremost When I Fall in Love, though you’d definitely think as much from the very festive and lovely cover art, is not a Christmas themed book. In fact, not a single part of it is set in December. What it is is a gorgeous story about moving on from a great loss and discovering life and how to love once again, and it definitely has that magical feeling. When I Fall in Love is the kind of book that can be read and enjoyed at any time of year and as such would make a perfect Christmas present for chick lit readers. When I Fall in Love is actually the first of Miranda Dickinson’s novels I have read but I’m definitely a convert. The warmth of her writing is simply amazing and her sense of humour makes me feel right at home. She also happened to get something in my eye once or twice.. how that happened is beyond me. It was just dust I swear. The characters in the novel really make the story what it is. Miranda has written side characters with as much life as the heroine, including characters that make just a small cameo, and without overburdening us with too much information either. They really give us a well rounded story and I loved every moment of Cher’s dating exploits and ice cream experiments in her little retro ice cream café, Woody’s bizarre quips and speeches but ever-present minuscule fanbase from his 15 minutes of fame in the 80′s, and Torin’s sporadic appearances. I did find the way Elsie treated Torin quite annoying, if I’m honest. Every time they met, he was nothing but kind but she would take something the wrong way and an argument would ensue but I have to admit that I loved the other part of Elsie that we saw whenever she was around him. To everybody else she was nothing but sweet but he brought out her passion. And I couldn’t stop laughing at Elsie and her sister’s trip to ‘that European furniture store’. I’m not saying why though, that would spoil the fun, but I had to mention it. Review originally on I Heart.. Chick Lit. 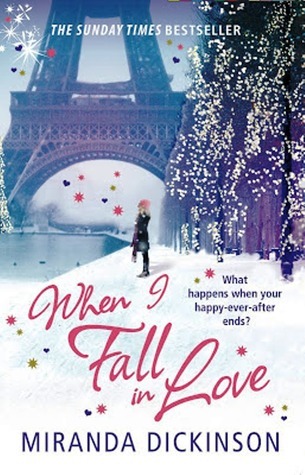 When I Fall In Love is the first book I've read by the lovely Miranda Dickinson, not that I've never heard of her - she's famous for her inspiring tales of young, independent women living their life as if in a fairytale - and I have to say, When I Fall In Love blown me away! I know I can be very persistent to read something that has caught my attention and for that, I'd like to apologise to Avon's PR. The thing is, I've neve Review originally on I Heart.. Chick Lit. The thing is, I've never read any by Miranda, so I told myself to think of When I Fall In Love as a debut novel. Well, it would definitely make a hell of a debut novel, I tell you. I neglected my Economics trial exam to finish this lovely, heartwarming tale. I just hope that I'd pass Econs, either way, I gained something I'd never regret, which is having the chance to read this life-changing book. When I Fall In Love is about Elsie Maynard's life, recovering from a *NOT TELLING YOU*, she's finally standing on her two feet, moving on. From the first chapter, I knew Elsie would be a lovable character, one I'd root for. She's exactly what a chick lit heroine should be, friendly, warm, loving and caring. I loved how she dealt with everything when things were not going the way she hoped they would, and for that, I'm glad to report that Elsie Maynard is a character you'd want to be best friends with. Aside from Elsie, the characters in the book were really, really wonderful and I'd be the happiest person to have them in my life. Well, in my head, they are my best friends, so you can imagine how deeply affected I am by the book. You know the feeling you get when you feel so warmly welcomed you are when you're with people? That's the feeling I got when I read the parts where Elsie, Daisy, Woody and the gang meet up. And I'm not telling you who these characters are. It's a surprise for you when you read the book once it releases on the 8th of November. The storyline is deeply moving, think of it as a really heartbreaking story with the most supportive family members and friends who'd help you get by. It's a really warm and compelling tale, perfect for the wintry days of the snowy season. Another thing that made me enjoy this little nugget of chick lit is that a part of the book was set in Paris! PARIS! Parfait! I strongly recommend this book to readers who loved Cecelia Ahern and Jojo Moyes. I'm a huge fan of Miranda Dickinson - I have loved two out of three of her books so far, and I've been eagerly waiting for this - it was so well worth the wait. Once again, Miranda Dickinson sets a wonderful Brighton scene (seriously, I would live there, that's how beautiful she makes it sound), amazing, colorful characters and tells a heartfelt, wonderful story with a healthy dose of humor - all of it written in a very skillful way, the prose was just wonderful, the chemistry between the charact I'm a huge fan of Miranda Dickinson - I have loved two out of three of her books so far, and I've been eagerly waiting for this - it was so well worth the wait. Once again, Miranda Dickinson sets a wonderful Brighton scene (seriously, I would live there, that's how beautiful she makes it sound), amazing, colorful characters and tells a heartfelt, wonderful story with a healthy dose of humor - all of it written in a very skillful way, the prose was just wonderful, the chemistry between the characters palpable. Elsie is probably my favorite of her heroines so far. She is such a strong, independent female character. Despite everything she's been through at such young age, she keeps moving on and you can't help but feel for her. Her relationship with her family, her friendship with Olly and the choir members were a joy to read. I have to say I was an instant Torin fan. He only makes short appearances in the book, but his presence is constant. The dynamics of the choir were so awesome to read. All members are well developed characters that you want to know more about and each and every one of them brought something important to the story. You can tell the author knows and loves music and it's such an important element of the book (it was the same with It Started With A Kiss...). It's hard to talk about this story without giving anything away. It might remind you of a certain other popular book, but I say it's much better. You can probably guess what Elsie's secret is from the beginning, but I won't tell you. What I can say is that her dealing with it seemed very realistic to me, Miranda Dickinson does it in such a respectful way. Her moments of "relapse" were also realistic, because things like these are hard to move on from even when your mind is set to do it. The Eiffel Tower scene broke my heart, I was silently weeping during the whole thing. The story really is that heartbreaking. I loved the ending, it was so fitting. I was glad that Elsie doesn't have some huge epiphany, but instead just goes for it because it feels right. I think he deserved that, but that's just me fangirling. First of, I'd like to say that this is a good book. But at the same time, it's because it's a good book and not a great book, that I then have to confess that I was a little disappointed by it. Maybe this was because I've read Miranda Dickinson before and really enjoyed her previous novels, but this one just didn't match my expectations of it. I think a lot of this disappointment has to do with characters, or mainly, that there are too many of them and not enough of a personality assigned to eac First of, I'd like to say that this is a good book. But at the same time, it's because it's a good book and not a great book, that I then have to confess that I was a little disappointed by it. Maybe this was because I've read Miranda Dickinson before and really enjoyed her previous novels, but this one just didn't match my expectations of it. I think a lot of this disappointment has to do with characters, or mainly, that there are too many of them and not enough of a personality assigned to each one. Of the characters there are, only Elsie and Daisy really made me care about them. The rest drift in and out of the novel with varying degrees of page-time, but even those allocated more of a presence still seem to just portray some kind of stereotype: the aging rocker, the tart with a heart, the shy young lovers, the arrogant love interest. None of them seem well developed enough to spark any interest in them and their lives, of which there is a lot. I kind of feel that if Dickinson had tightened up her characters (maybe ditched some of them and expanded the roles of others) then this book would have been left with a lot more people that you actually want to read about. My other problem with this novel is the subject matter: dealing with the death of a loved one and moving on from that death. Part of my disappointment from this side of the novel isn't from the book itself, but that at the end of last year, I read Lucy Dillon's Walking Back to Happiness, which deals with the same subject but isn't quite as glossy or dewy-eyed over the subject, and therefore I enjoyed that story more. When I Fall in Love follows the pattern of a fairytale with regards to that more and in my opinion comes off the worse for it. I love Mirandas books but this one i just could not get into. I seemed to have to force myself to finish it, i was hoping it would get better as the story went on, but it didn't. The story was about Elsie who is trying to rebuild her life after the loss of her husband. Nothing new there but Elsie is only in her twenties and never expected to be a widow so early in life. Through the rebuild process Elsie starts to step out of her comfort zone, she sets out to start a choir with legend rocker Wood I love Mirandas books but this one i just could not get into. I seemed to have to force myself to finish it, i was hoping it would get better as the story went on, but it didn't. The story was about Elsie who is trying to rebuild her life after the loss of her husband. Nothing new there but Elsie is only in her twenties and never expected to be a widow so early in life. Through the rebuild process Elsie starts to step out of her comfort zone, she sets out to start a choir with legend rocker Woody. She also has run ins with the lovely and very patient Olly and the ever annoying Torin. Both very different and gradually start to appear in Elsie's life. Elsie believes she is destined to be with Olly when she finally settle the past to rest. But Torin appears throughout and just annoys Elsie. He seems so full of himself, he is rude, but then so is Elsie towards him. The story takes the choir to pairs something that is deeply marked in Elsie's heart. Here she finishes the last of the list that ties her to her husband. My main issue was that the characters were hard to connect with. I didn't believe any of them realistic. The ending of this book annoyed me more. I just didn't agree with it and it seems so very out of the blue. Knjigu sam odabrala jer je oznacena kao Bozicna, pa rekoh ajde malo zbog praznicnog duha, bez nekih narocitih ocekivanja.Nije bilo ni traga Bozicu. Medjutim nudi jednu lepu pricu, kako se ljudi nose sa gubitkom i kako krecu dalje. Nasa junakinja u tom procesu upoznaje nove ljude, osniva hor, ide na sastanke i polako okrece novi list. Tu je i put u Pariz. Zao mi je sto se kod nas ne prevodi toliko Chick lit zanr, ima tu finih knjiga! Е ова многу повеќе ми се допадна од Продавачка на егзотика!!! Sweet and easy to read... one of the books where from the beginning you know what will happen at the end. Konu fena değildi ama sonu çok anlamsızdı. Mit neuem Mut macht sich Elsie an die Umsetzung und gründet als erstes einen Chor, um sich auch wieder unter Menschen zu mischen. Und sie möchte sich wieder mit Männ Elsie ist noch jung, hat jedoch schon eine Menge erleben müssen. Vor 18 Monaten verstarb ihr Mann Lucas an Krebs und seit dem versucht sie, wieder ins Leben zurückzufinden. Dafür hat sie eine kleine Satinbox auf dem Nachttisch stehen, in welcher sich Botschaften ihres verstorbenen Mannes befinden, die sie sich zu Herzen nehmen soll. You can tell that Miranda puts her heart and soul into her writing. This story was gorgeous. And even though I have not dealt with bereavement, I have dealt with loss. My long term relationship ended recently so I could completely understand Elsie's vulnerability and heartache. The book keeps you guessing till the end and I was in complete tears when we travelled to Paris. It also really helps that I'm in the thank you's. Bring on book 5!! It is somewhat predictable but I love the details of each situation and how it makes u feel like a part of the story. It is also emotional, in a way where I was touched and well sometimes thought about stuff. The list is cute! My favorite all along was Torin!! Oh and woody ofx! C'est magnifique! Dvije rijeci iz romana koje ga opisuju u potpunosti! Not my cup of tea at all (no sugar, not too hot please) Until I started reading. Elsie Maynard sounds like an older lady's name. My dislike of chick-lit is legendary but as my usual knights-on-quests novels appear to be getting harder to find I gave this a go. I particularly liked Jim Maynard, Woody Jensen, the rock star –- I liked him a lot, I could “hear” Hellfinger (in my head they've got a heavy bluesy sound, occasionally acoustic, they made 1 album then split due to his drinking issues) I Not my cup of tea at all (no sugar, not too hot please) Until I started reading. Elsie Maynard sounds like an older lady's name. My dislike of chick-lit is legendary but as my usual knights-on-quests novels appear to be getting harder to find I gave this a go. I particularly liked Jim Maynard, Woody Jensen, the rock star –- I liked him a lot, I could “hear” Hellfinger (in my head they've got a heavy bluesy sound, occasionally acoustic, they made 1 album then split due to his drinking issues) I liked Cher Pettinger, the owner of the retro ice cream shop. I'd love to try the Parma Violet and rose-petal ice cream. I do wonder whether Woody Jensen was actually in a band at all or took so many illegal substances he only believes he was. It happens I suppose. I used to be in a music therapy group myself and I have fond memories of it; i'd probably wear that t-shirt with strategically placed ice creams. I love writing myself, there's usually at least one or both of these sorts of characters in my own stories. The idea of living in a commune really appeals to me, and I had to search Gardner St. to see if it was real. It is, and I'll now put going there on my own version of “The List”. The box of notes starting with “I love you because ____” was a great idea and when you find out why Elsie keeps the notes with her it's heartbreaking. I cracked up at “speak only in Shakespearean for an entire day”. Pleasant and relaxing read. Verrrrry British in terms of characters and the overall spirit / mood. The biggest positive of the book is that it shows how a person can handle grief over a major loss. I was crying like an ugly pig in the last quarter of this book. So bleh. So cringey. So not impressed. Too much coincidences and it seems like Torin is everywhere on the planet. Miranda Dickinson is one of my favourite authors, ever. I feel like I say that a lot, but trust me, I don’t. Since her first novel, Fairytale of New York, I have been enchanted by her novels. She writes the most romantic Chick Lit you will EVER read. They’re pure love stories, and she’s now on her fourth novel (which makes me say in disbelief, only four?) called When I Fall In Love and is yet another fantastic novel. She cannot do no wrong as far as I’m concerned, she just captures your imaginat Miranda Dickinson is one of my favourite authors, ever. I feel like I say that a lot, but trust me, I don’t. Since her first novel, Fairytale of New York, I have been enchanted by her novels. She writes the most romantic Chick Lit you will EVER read. They’re pure love stories, and she’s now on her fourth novel (which makes me say in disbelief, only four?) called When I Fall In Love and is yet another fantastic novel. She cannot do no wrong as far as I’m concerned, she just captures your imagination so well, with such warm characters and clever plots, and if you haven’t ever tried Miranda’s books before you really are missing out because she’s a Chick Lit treasure. When I Fall In Love tells the story of Elsie Maynard. She’s had a very tough year, and her life has fallen apart. So when she ends up putting on an impromptu singing performance at a local cafe, she finds her life looking a little rosier as Woody Jensen saw her performance and wants to start a choir. But not an ordinary choir – for washed-up rockstar Woody, a normal choir would never do. No, he wants to have a modern choir, a choir that will speak to everyone, a choir Elsie is very happy to be a part of, and so, starts The Sundaes. As Elsie battles to re-start her love life, the choir is a solace from everything, and as she finds herself attracted to Olly, and butting heads with irrepresible Torin, will she be able to overcome her difficult year and fall in love again? What I loved about When I Fall In Love was the characters. The characters are a massive, massive part of the novel and right from the start I was caught up in Elsie’s life, and her sisters’ and dad’s lives. The choir idea was utterly brilliant. Choirs don’t interest me in the slightest, and yet, I absolutely adored everything to with The Sundaes. I loved all the singers, I loved the setting (Sundae & Cher, the shop where Elsie works), I loved their meetings, their arguments, their passion, their performances. I’d still say, if you asked me, that I wouldn’t go and see a choir perform because it just isn’t my cup of tea, but Miranda Dickinson writes SO well that it could be about anything and you would still be interested. It could be about something you hate with a passion and she’d still make it sound like something wonderful and something you really loved reading about. That’s Miranda’s talent, she makes you love something you wouldn’t normally ever love. I loved everything to do with The Sundaes, and all the various personalities meant I never got confused with all the characters. If I had any issue with the novel, it was perhaps the love story. It was really good, but because of how long the Olly thing went on, the other bit sort of got a bit left. I liked Olly, but I felt that if Elsie was interested she would just go for it. Despite everything Elsie had been through, I firmly believed that she would have just went for it if it was meant to be with Olly, despite what she believed. I loved Torin, and I would have just liked a bit more of him. I liked that he and Elsie rubbed each other up the wrong way. I liked their arguments because it added a bit of spice to proceedings, and I never felt that their arguments were genuine arguments, well except for one instance. It was banter, at best. I did adore the family element to the story. How the Maynards are this superclose family, with Elsie, Guin and Daisy, the sisters, and their dad, Jim. The closeness was so lovely, and even the bond between The Sundaes was really great, in particular I loved Woody, he really made an impression on me! But eighteen months on from the biggest challenge of her, she is doing just that - because she made a promise to the person who believed in her the most. Then a heartfelt request brings her to Paris - and the final item on 'The List' she never dared complete. Can Elsie follow her heart and put her past to rest? I just loved this book so much, It tugged at my heart strings so much and left me in floods of tears by the end, I loved the flow of writing and how Miranda gets you sucked in the book so much as though you feel like you've known the characters all your life. It was a fantastic read and with all the mix of characters they all just mixed nicely together and you never get confused with which character is who. I would say Elsie Maynard would have to be my favourite Heroine indeed, she came across as such a lovely woman who is clearly had a tough eighteen months of losing her husband to Cancer and then having to rebuild her life which is what her husband Lucas' wishes were. I felt at times I just needed to give her a big hug and make everything okay. Having lost a family member to Cancer myself I clearly knew how Elsie was going through and how tough it actually can be. For Elsie and all her choir to get the chance to go to Paris made me smile and dream alot when describing Paris and all the iconic scenic places. I liked that at the end of the story, Miranda included 'The List' that Elsie and Lucas created together, it was cute but also funny to imagine some of the things being done on the list. I do think this book is a perfect winter read which you will need a box of tissues at the ready. I was so excited about Miranda Dickinson’s latest novel, having been lucky enough to receive a sneak-preview chapter from her in the post; I was desperate to read the rest! I so pleased to find that book number four from this lovely author delivered her usual mix of optimism, cake and of course romance, the perfect recipe! Although the cover might suggest a Christmasey or even a wintery novel, don’t be fooled, none of this book is set in December! When I fall in Love follows Elsie eighteen month I was so excited about Miranda Dickinson’s latest novel, having been lucky enough to receive a sneak-preview chapter from her in the post; I was desperate to read the rest! I so pleased to find that book number four from this lovely author delivered her usual mix of optimism, cake and of course romance, the perfect recipe! Although the cover might suggest a Christmasey or even a wintery novel, don’t be fooled, none of this book is set in December! When I fall in Love follows Elsie eighteen months on from the death of her husband and her dealings with her best friend Cher, a new choir project and two possible new love interests. Elsie is such a lovely character. She seems too innocent and open for someone who has lost their husband at such a young age… ‘I was loved by the most amazing guy in the world for eight wonderful years. Most people don’t get to enjoy that kind of love their whole lives. I count myself as one of the lucky few’. She has the typical optimism of one of Dickinson’s characters, and you find yourself willing her to open her heart and find love again, all the way through the book. The story centres around Elsie’s dealings with a new choir she has started with a local, aging rocker. This was unchartered territory for me but I found it to be a really nice hook into the storyline, and it leads to the introduction of several new characters, each of whom add depth to the storyline and come with their own brand of love and sweetness. The addition of Elsie’s family is also really lovely because it makes the whole novel feel like a comfortable cosy night in surrounded by friends and family. The two male characters vying for Elsie’s attention are equally well-developed and seemingly couldn’t be more different from one another, and I think that this was vital for the structure of the storyline. ‘I want to make you feel cared for all the time…and I know were taking it slowly and you’ve had things you wanted to deal with, but I just want you to know that you only have to say the word and…I’ll be there’. The setting of the novel was really well described, having never been to Brighton, I really felt like I got to know the town and was wandering through its streets with Elsie and the other characters, and of course, Paris was also as elaborately described, and given the level of romance befitting of Miranda Dickinson’s writing. Obviously the book deals in some part with death, and so I did shed a few tears, but there were also parts of the book that made me laugh, especially when Elsie and her sister take a trip to a Swedish furniture store in Croydon, ‘Croydon? Who goes to Croydon for anything?’ A lovely thing is that at the end of the book, the reader is given a bonus, a list of the messages that Elsie’s late husband left for her. I defy even the coldest of hearts not to be warmed by this list, and indeed the whole of the book for that matter. Even if you haven’t read any of Miranda Dickinson’s previous novels, you will be certain to enjoy this one, and most probably want to acquire her others as soon as you finish it. A truly lovely novel! Having read and enjoyed all of this authors previous books it was a bit of a no-brainer that I would buy this one. As with all Miranda’s books the cover was gorgeous and I was looking forward to jumping into her latest creation. Wow! I’ve always loved this authors writing style so I was pretty confident that I would enjoy the book, but I was surprised that I felt so connected to the storyline when I haven’t been through it myself. Tears didn’t just fall – they poured as this wonderful story took Having read and enjoyed all of this authors previous books it was a bit of a no-brainer that I would buy this one. As with all Miranda’s books the cover was gorgeous and I was looking forward to jumping into her latest creation. Wow! I’ve always loved this authors writing style so I was pretty confident that I would enjoy the book, but I was surprised that I felt so connected to the storyline when I haven’t been through it myself. Tears didn’t just fall – they poured as this wonderful story took me to places I had never thought of. I didn’t only feel sadness though, there was laughter, shock and happiness all rolled up in one fabulous book! I was laughing out loud by page two – what a great start! I was keen to find out exactly what had happened eighteen months previously to stop Elsie dating, I was just as keen to find out the meaning of ‘The List’ and the lovely little notes. Once I understood what they were all about I filled up with tears every time a new one came up. Elsie was a wonderfully warm character who I liked straight away, I loved the closeness of her family and I quickly felt like I was a part of it too. A spontaneous singing moment that had me smiling from ear to ear was an important turning point for Elsie and I couldn’t wait to see where it would take her. I was completely torn between the two main male characters, I kind of fell in love with them both and couldn’t decide who would be best for Elsie. The choir was another great part of this book and I thoroughly enjoyed following their progress, one of my favourite choir moments came during a performance – an 84-year-old member finished the show with some awesome air-guitar moves! Paris was lovely and also the cause of most of my tears, there was a particularly heartbreaking moment that had me sobbing – it was written beautifully and I was so caught up in Elsie’s life that I just couldn’t stop crying. At the end of the story I got to read the actual ‘List’ and I thought this was a lovely way to end the book as it made me smile before I closed it. Elsie Maynard has decided that it is time to start again and pick up the pieces of her rather broken heart and spirit. She has faced a tragedy that I would never wish on anyone, and I don’t want to say too much because I don’t want to give key elements in the story away. When I started reading the book, Elsie seemed very solemn and somber and maybe even a little bitter. I later learned why. After a few pages in she makes an announcement to her sisters and family that she is ready to start dating Elsie Maynard has decided that it is time to start again and pick up the pieces of her rather broken heart and spirit. She has faced a tragedy that I would never wish on anyone, and I don’t want to say too much because I don’t want to give key elements in the story away. When I started reading the book, Elsie seemed very solemn and somber and maybe even a little bitter. I later learned why. After a few pages in she makes an announcement to her sisters and family that she is ready to start dating again, and I immediately started asking questions. I became attached to Elsie rather quickly and was cheering her on the entire time. This story is Elsie’s journey through heartache and her rebirth! Miranda Dickinson can write some really strong and moving characters, and believe me this book was full of them. I personally fell in love with the relationship that Elsie shared amongst her sisters, Daisy and Guin. I loved their connection and the laughter that they brought right from the start. We also have Elsie’s dad who I could tell was where a lot of her strength and support came from. Possibly one of my favorite characters was Cher, who owns the café in which Elsie works in called Sundae & Cher, quoted above. All of these secondary characters, and so many more, help Elsie on her trying and tremendous journey to start all over again. I was laughing my head off because of the wittiness and just pure sparkle that some of these characters brought the pages. Elsie finds herself in some pretty amazing situations and presented with some awesome opportunities that I am sure she never thought she would experience. This book is about learning to live and love again, and Elsie is a truly inspiring and dynamic character. From her moments in the ice cream shop, Sundae & Cher, to the streets of Paris with her choir, she is experiencing a life-altering change and I felt like she invited me, graciously, along for the ride. This is truly a story about love, loss, and learning to start over from the ashes. I couldn’t have asked for a sweeter story that truly pulled on all of my heart strings. This book made me question things in my life and what I would do if I were ever in Elsie’s shoes. Truly a great reflection novel and I am new born fan of Miranda Dickinson! Miranda Dickinson has always had a head full of stories. Coming from a creative family where stories and songs were always present, it was perhaps inevitable that she would end up adoring words. A songwriter for over 15 years, Miranda has successfully penned over thirty songs, delivering both live and recorded performances in a range of venues across the UK and Europe. Her first solo project album Miranda Dickinson has always had a head full of stories. Coming from a creative family where stories and songs were always present, it was perhaps inevitable that she would end up adoring words. A songwriter for over 15 years, Miranda has successfully penned over thirty songs, delivering both live and recorded performances in a range of venues across the UK and Europe. Her first solo project album, About Time is due for release this year. To hear her music, visit www.mirandadickinson.com - and be sure to leave a message if you like it!